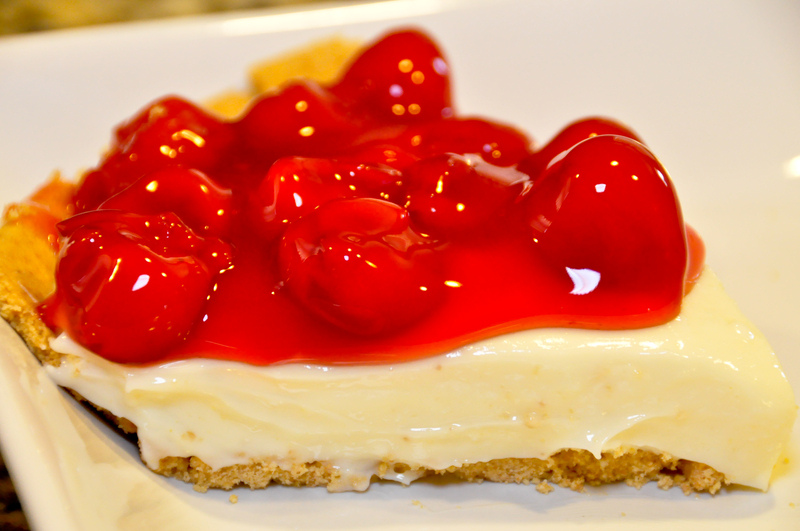 Cream Cheese Pie – Mama, Can I Lick the Spoon? Mama, Can I Lick the Spoon? Mama, Can I Paint the Room? Everybody in our family cooks. While I do most of the cooking, that’s by my choice. I have this crazy control freak nature and I like to be in charge of my kitchen. There are so many things in life that I can’t control, it’s nice to have one place where I’m actually in charge! But once in a while, at the end of the day, I’ll get a text from Michael that says, “Dinner will be on the table when you get home.” Bliss! He makes amazing spaghetti and meatballs – among other things – and I love it when he does! Christopher has made the yummiest cheesy scrambled eggs since he was seven years old. Honestly, they’re the best! He loves to cook and experiment in the kitchen. The recipe for chewy brownies that I have here is actually one that he and I created together. Elizabeth is our resident omelette maker and she’s always coming up with a yummy dip or snack. She especially loves making custom popsicles. But at Thanksgiving, this is her specialty. I grew up eating this pie. My mama would make it and we would go out and pick huckleberries from the bushes on our property. Huckleberries are a variety of blueberries. Most of them grow wild where we live. Mama would cook them with a little sugar and water to make a syrup and would pour it over this cream cheese base. It was always a treat. We could have picked enough to freeze so that we could have had this pie all year long, but we ate as many (or more) as we put into the buckets, so there weren’t many left! Now this is Elizabeth’s pie. With only five ingredients, it is a simple, but delicious pie. Rich and velvety, yet somehow light. Sweet from the sweetened condensed milk, but with the tang of cream cheese. It’s just perfect. In a mixing bowl, use a mixer to cream the cream cheese. Add the sweetened condensed milk and mix until completely combined. Add the lemon juice. Once combined, spread evenly into a graham cracker crust. Refrigerate for at least 2 hours to firm. Before serving, top with pie filling. Well Duh #1: You can use any kind of pie filling you prefer. My family just loves cherry. I have also topped it with fresh fruit. Yummy! It is delicious with mandarin oranges, sliced strawberries, kiwi – even sliced grapes. I once topped it with caramel and nuts and it was divine! Well Duh #2: You can, of course, make your own graham cracker crust. I did not this time, for convenience sake. Well Duh #3: Make sure you use a rubber spatula and get every single delicious smidgen of sweetened condensed milk from the can. The true advantage of this, of course, is that you can lick the spatula afterwards! Well Duh #4: It doesn’t matter if you use freshly-squeezed lemon juice or the stuff from a bottle. I usually use the bottle because I almost always have it in the refrigerator. Well Duh #5: If you’re into perfectly perfect servings – and trust me, I understand the need to make food pretty! – you should cut the pie before topping it with whatever you’re using. Well Duh #6: You really have to let the cream cheese soften completely. Otherwise you’ll have chunks of cream cheese in the pie and not a smooth filling. If you’re impatient, just unwrap the cream cheese, put it in a bowl, and microwave for 1 minute. We had several desserts at my parents’ house this Thanksgiving: pecan pie, sweet potato pie, buttermilk pie (if you’re not from the South, you will think that sounds gross, but it’s not! ), black cherry salad, and cookies. When we went through the “dessert line” the first time, we forgot all about Elizabeth’s pie because it was in the refrigerator. By the time we remembered, we were all miserable and couldn’t eat another bite and I was very happy that I’d worn my stretchy pants! In a way, I’m glad that happened because when I did get a piece of her pie, I wasn’t overstuffed. I could actually enjoy and savor this wonderful piece of heaven! I almost didn’t want to remind everybody that it was there! But I did and we all agreed that it was delicious! Potato Leek Frittata – Mama Can I Lick the Spoon? on Beefy Mac & Sloppy Joes – 30 Minutes for 2 Delicious Dishes! © 2019 Mama, Can I Lick the Spoon?